No one likes a breaking down, especially if it means time spent not earning. As a business owner, safety should be your highest priority. No matter if your fleet is made up of vans, cars or trucks; it’s your responsibility to make sure they’re well equipped, at all times, for any unpredictable eventualities. When you have broken down you’ll want your drivers to be back on the roads as soon as possible. Make sure they’re aware of the protocol they need to follow and leave instructions in the vehicle that are clear and easy to find. On these instructions, clearly notify the number of your breakdown service provider and leave all the relevant information they need to action a call for roadside assistance. Providing details of your insurance policy can be helpful too. In the UK we rarely see sunshine, this is why it’s a good idea to pack extra clothing in case you get caught out in the rain, wind, snow or sleet. A warm jacket or blanket is ideal, along with a lightweight waterproof coat or poncho. We lose heat from our heads, hands and feet so, packing an extra pair of socks and a hat and gloves will keep your employees warm in the colder months. If one of your employees breaks down on the side of the road or in a layby, it’s important that they exit the vehicle when it’s safe to do so and find a point of refuge away from oncoming traffic. Staying safe should always be a high priority. Do make sure they are prepared by keeping a torch, high-visibility jacket and reflective warning triangles in the vehicle at all times. It’ll alert road users that they’ve broken down and make them easy to notice. Depending on the space in the vehicle, it can be extremely beneficial to have some of these essentials with you in case you break down. It can be a good idea to pack jump start cables as well as extra bulbs and fuses. 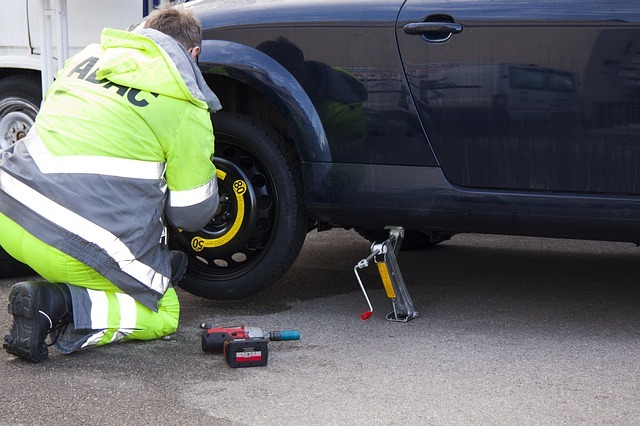 In case of a flat tyre, make sure you have a spare in your vehicle and a jack ready. Many vehicles now don’t come with a spare wheel when they roll off the production line and onto the dealer’s forecourt so it’s a good idea to invest in one. It’s surprising how many drivers in the UK breakdown because they’ve run out of fuel. If you carry an empty fuel can with you, there may be a safe opportunity for you to walk to a petrol station and fill up, without having to wait for the breakdown service to arrive. However, walking along busy roads should be avoided and getting fuel should only be done if it is safe to do so. Another good thing to have in the car is fuel for yourself. Make sure you’ve got a sealed bottle of water and non-perishable snacks in the car. This will help keep your energy up if you’re waiting a long time for recovery.